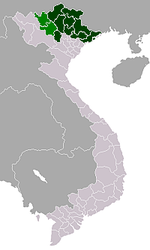 Thái Nguyên ( listen) is a city and municipality in Vietnam. It is the capital and largest city of Thái Nguyên Province. The city is listed as a first class city and is the ninth largest city in Vietnam. It has long been famous throughout Vietnam for its tea. In 1959 it became the site of Vietnam's first steel mill, and is now home to a large and growing major regional university complex. Thái Nguyên City is located on the Cầu River. Its area is approximately 189.705 km2 and its population was 330,000 in 2010. The city played an important role in Vietnam's struggles for independence during the French colonial era. The Thái Nguyên uprising in 1917 was the "largest and most destructive" anti-colonial rebellion in French Indochina between the Pacification of Tonkin in the 1880s and the Nghe-Tinh Revolt of 1930–31. In August 1917, Vietnamese prison guards mutinied at the Thai Nguyen Penitentiary, the largest one in the region. With the aid of the freed inmates – common criminals as well as political prisoners – and weapons captured from the provincial arsenal, the rebels were able to take over control of local government offices. They then established a fortified perimeter, executed French officials and local collaborators, and called for a general uprising. Although they were only able to hold the city for five days, French forces were not able to pacify the surrounding countryside until six months later, leaving many casualties on both sides. During the First Indochina War, the province played an important role as a safe area (abbreviated ATK in Vietnamese for An Toan Khu, 安全区) for the Viet Minh. In 1956 the town became the headquarters of the northernmost military region, called Viet Bắc, until reunification in 1975. 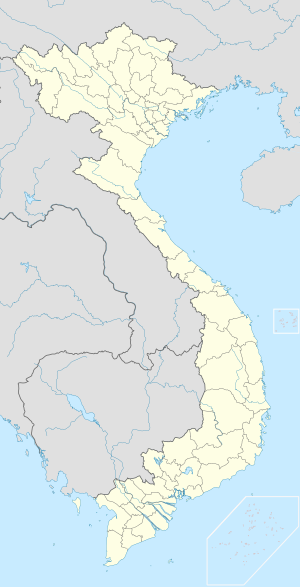 Originally a small township including four residential quarters, two towns, and six communes with a combined population of approximately 140,000, Thái Nguyên became a city on 19 October 1962. Before that date, the area was a part of Đồng Mô commune, Đồng Hỷ district. Thái Nguyên City has long been famous throughout Vietnam for the quality of its green tea, with Tân Cương Commune producing the most widely recognized brand. Since 2007 it has shipped an average of about 22,000 tonnes of tea domestically and 7,500 tonnes overseas, to Algeria, France, Iran, Iraq, Japan, Pakistan, and Taiwan. In an effort to boost exports, the city hosted its First International Tea Festival in November 2011. The effort seems to have paid off. During the first five months of 2012, it exported 49,000 tonnes, an increase of over 15% from the prior year, with Pakistan its biggest customer. In 1959, the city also became the center of a nascent metallurgical industry, with the creation of Thái Nguyên Iron and Steel Company (TISCO), thanks to its ample local resources of iron ore and coal. The new mill produced its first cast iron in November 1963. In 2009, it was converted from a wholly government-owned enterprise to a partially privatized joint-stock company. By 2011, its output reached 230,000 tonnes of pig iron and 400,000 tonnes of steel ingots. Although its primary production mills are located just south of Thai Nguyen City, it now has 17 branches and 6,000 employees, with another 8 partially owned subsidiaries in 9 northern provinces. It has won many national awards and now exports steel to Cambodia, Canada, Indonesia, Laos, and other countries overseas. Thái Nguyên University (TNU) is one of the major regional university systems in Vietnam, serving the entire northern mountain region with more campuses than any city except Hanoi and Ho Chi Minh City. In 1994, these many centers of learning were united under one general administration. Its components include seven Colleges (Education, Engineering and Technology, Agriculture and Forestry, Economics and Techniques, Economics and Business Administration, Medicine and Pharmacy, Communication and Technology), a School of Foreign Languages, and an International School. Other components are a teaching hospital, a publishing house, three research institutes, and a center for national defense education, a center for international cooperation, a center for human resource development for foreign language studies, and the office of the president. TNU is also home to one of four national Learning Resource Centers, the others being in Hanoi, Huế, Ho Chi Minh City, and Can Tho. TNU offers undergraduate, postgraduate, and vocational education, as well as research and extension services. Museum of Cultures of Vietnam's Ethnic Groups is located in Thai Nguyen City. It is the largest museum of Vietnam's ethnic minorities, spread over an area of 39,000 m2 in Vietnam and was established in 1960. It is housed in a pink coloured building where an assortment of impressive exhibits of more than 10,000 documents and artefacts, which belong to the cultural heritage of 54 ethnic tribes of Vietnam, can be seen. It is surrounded by extensive gardens where locals often exercise in the early mornings and evenings. On hot nights, you can enjoy a beer and boiled peanuts with the locals in the beer garden at the back of the museum garden. This is the central fountain which families and young people gravitate to on warm summer evenings. It has many coloured lights, and you can have your photo taken by a professional photographer, Mr Cuong, on busy nights. Near the central fountain is the Heroes Monument, set on a small hillside. You can walk up the many steps to the top and enjoy views over the city. Just off the main street, adjacent to Dong A 1 Hotel, is Coffee Street. There are over 20 cafes in this short street, where you can sample Vietnamese coffee at its best. Thái Nguyên City includes 21 wards and 11 communes. ^ "Quyết Định Về Việc Công Nhận Thành Phố Thái Nguyên Là Đô Thị Loại I Trực Thuộc Tỉnh Thái Nguyên". Thuvienphapluat.vn. Retrieved 2012-09-15. ^ a b "Thai Nguyen brews up a tasty tea festival". Vietnam Investment Review. 5 November 2011. Retrieved 19 June 2012. ^ a b "TISCO - Leading Light of Steel Industry". Vietnam Business Forum. 3 May 2012. Retrieved 2012-06-19. ^ a b "Thai Nguyen University". Retrieved 2012-06-19. ^ a b Zinoman, Peter (2000). "Colonial Prisons and Anti-colonial Resistance in French Indochina: The Thai Nguyen Rebellion, 1917". Modern Asian Studies. 34: 57–98. doi:10.1017/s0026749x00003590. ^ "Business in Brief 08/06". VietNamNet Bridge. 8 June 2012. Retrieved 2012-06-19. ^ "Thai Nguyen University (TNU)". Ministry of Education and Training. Retrieved 2012-07-06. ^ "Vietnam Building Code Natural Physical & Climatic Data for Construction" (PDF). Vietnam Institute for Building Science and Technology. Archived from the original (PDF) on 22 July 2018. Retrieved 4 August 2018. This page was last edited on 2 March 2019, at 12:15 (UTC).